Have the January blues taken their toll on you so far this year? Fear not, as today's focus is all things green, instead. The color predominantly signifies nature, meaning it's wonderful for bringing the outside in. From yellowish tones to olive hues to emerald shades, green evokes a sense of security and people feel grounded in its presence. It's a rare choice for the dining room, yet when done right it can easily create contrast, drama, richness, and balance — all of the essential ingredients for entertaining. Don't believe us? 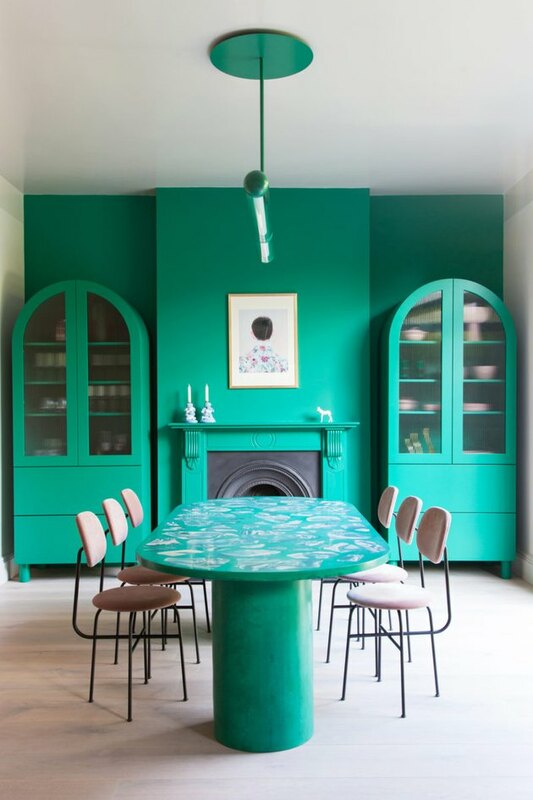 Check out these six dining rooms that bring out the green-eyed monster in all of us. Painting the ceiling the same color as the walls is a sure way to up the drama in a room. This dining space designed by Hayon Studio combines jewel tones like emerald green, sapphire blue, and citrine yellow to create a rich aesthetic that's cozy and chic at the same time. 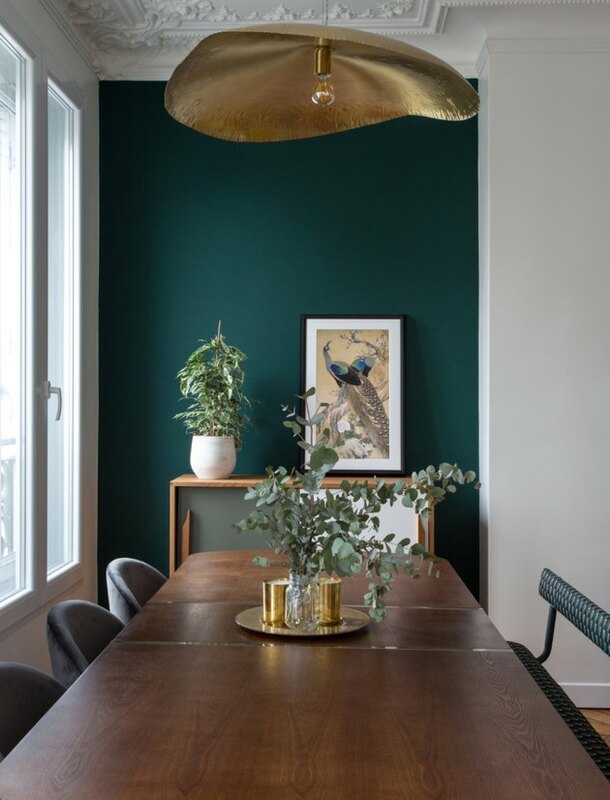 We can't decide which part of this Parisian dining room we love the most: the decorative ceiling molding, the mismatched dining chairs, the brass pendant, or the decadent fir green paint. Designer Marion Alberge did a beautiful job warming up this chic pad by bringing in a hint of the outside with a vibrant accent wall, dark wood dining table, fresh greenery, and peacock artwork. Dark green is the perfect accompaniment to midcentury furnishings, especially those using cane or rattan. 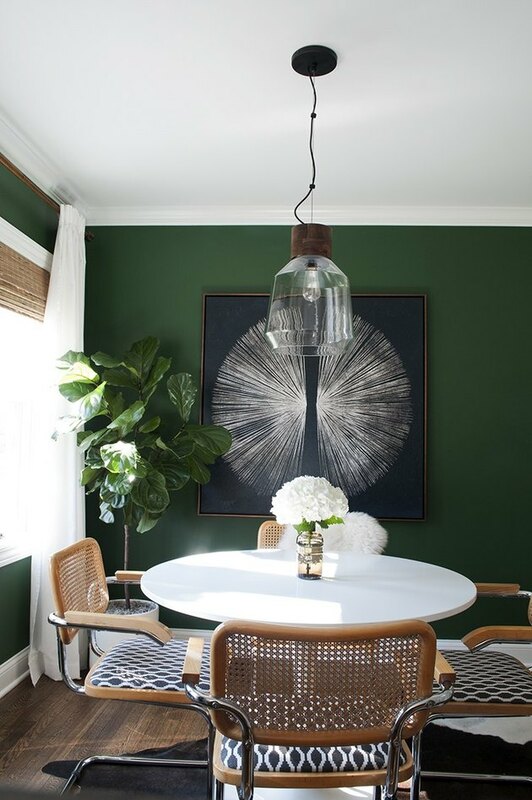 This room, belonging to Sarah from Room for Tuesday, is painted in Sherwin Williams Evergreens and has been paired with Knoll dining chairs, a hide rug, retro lighting, and a fiddle leaf fig for good measure. 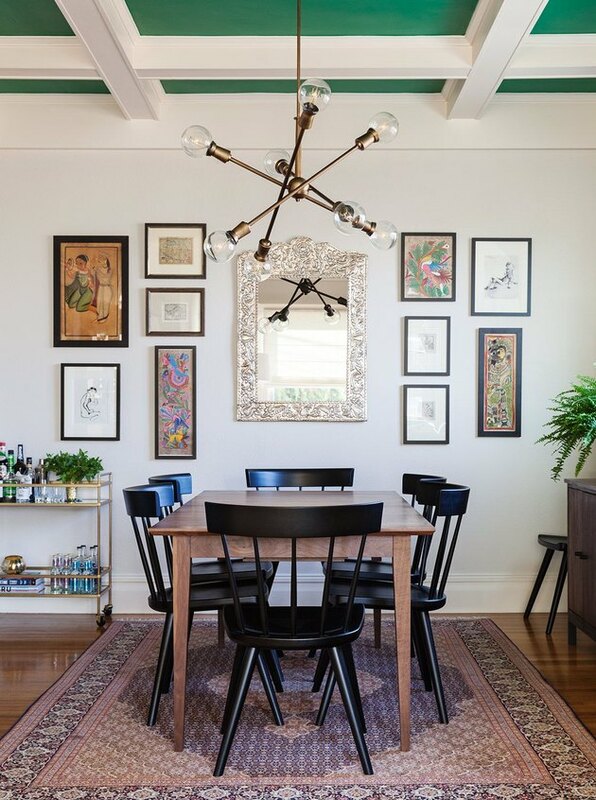 Take some inspiration from 2LG Studio's latest tone-on-tone dining room renovation. 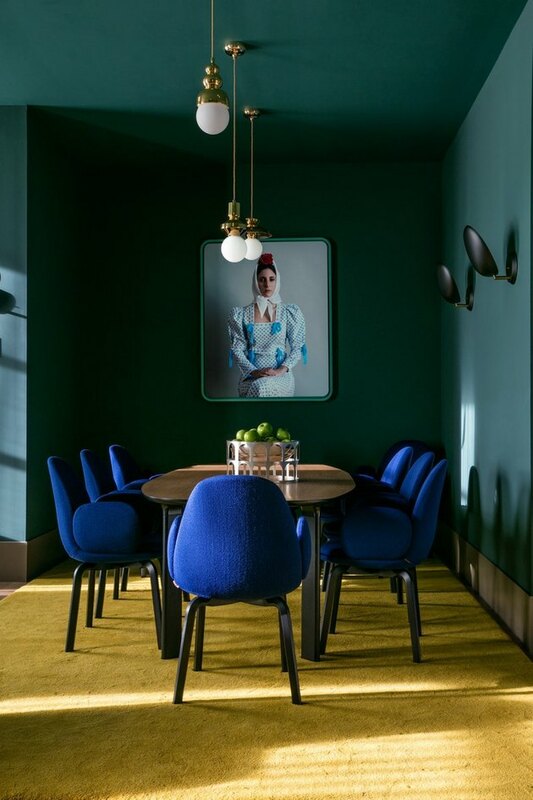 The sea green accent wall and matching arched cabinetry anchor the room's design and complement the large chunks of turquoise aggregate in the Jesmonite dining table that was commissioned from artist Olivia Aspinall. Making a statement doesn't mean that you have to go to town with brilliant shades of green. This dining room by Christy Allen Designs features white walls, letting the moss green ceiling and brass chandelier be the focus. The room is further balanced with plenty of plant life, a gallery wall, and wood furniture. 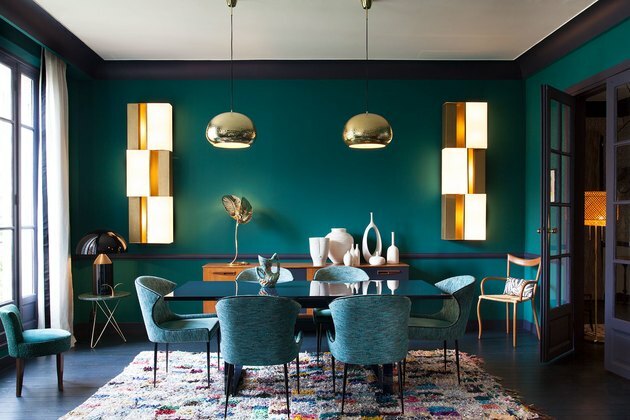 Metallic finishes pop when paired with green, especially teal shades, so it's no wonder that this dining room by Anne-Sophie Pailleret oozes glamour. The similarly colored dining chairs bring an added layer of texture to the space, while the dark wood table ensures the overall design isn't too overpowering. Bring on the food, please!